Moto Demon Speed Shop, a Rotherham-based specialist provider of automotive protective graphics that supplies many of the world's top motorcycle riders and teams, is targeting the Australian market following an international research project carried out by RiDO's ERDF-funded Soft Landing Zone. Based in The Boiler House on Alma Road, the business was established in 1997 and manufactures a wide variety of tank pads, numberboards and decals for leading brand superbikes including Ducati, Suzuki, BMW and Kawasaki. RiDO's Growth and Prosperity in Rotherham (Soft Landing Zone) project aims to assist companies in accessing international markets and also helps foreign inward investors who choose to locate to RiDO's business centres. The company was looking to expand its market and approached RiDO to help with identifying market opportunities in Australia. RiDO also arranged for Moto Demon Speed Shop to benefit from an Export Communication Review where the company was given a series of recommendations for making its website appeal to key target markets overseas. Nathan Woodcock, business development co-ordinator for RiDO (pictured, left), said: "Moto Demon asked us to focus on the Australian market, as the country has a large number of motorbike enthusiasts and a strong distributor network, as well as an appetite for products that are "Made in England." Our market research project has given the company contacts with a large number of relevant distributors and organisations in Australia that should be extremely valuable in growing the business. We wish Mark and the Moto Demon team well as they set out to further expand their business overseas." 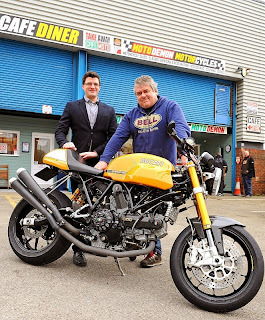 Mark Jarvis, managing director of Moto Demon Speed Shop (pictured, right), added: "We have supplied a small amount of product to Australia before, but RiDO's research has shown what a huge market this could be for us. We found RiDO's support invaluable and they have provided us with an excellent resource to call upon. We are very excited about the opportunities to expand our business in Australia and other international markets." All Moto Demon's graphics are manufactured here in Rotherham, with a wide range of standard designs, as well as bespoke designs to suit customer's needs. The tankpads are manufactured from high quality vinyl, which is thermally printed and coated with a 3D gel layer, which is UV stable and extremely robust. All staff at the company are keen bikers, which helps to understand the customers' needs. The company has over 30 distributors of its products around the globe and has recently experienced growth in markets such as China.